It seems like when I’m in the mall and hear parents talking to their kids, I hear unusual names more and more often. I’ve been developing a theory that parents are enjoying creativity more and valuing tradition less when that birth certificate rolls around, so in keeping with Corona Insights tradition, I thought I’d explore it a little more with some data analysis. Off I went to the Social Security Administration website to put together a database of names. 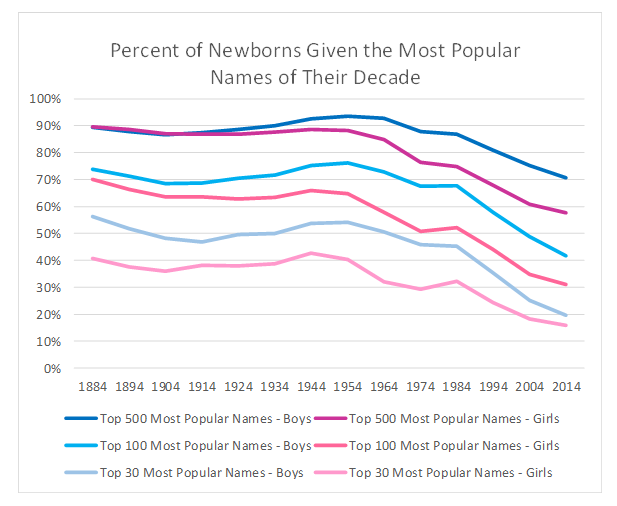 I took a look at the most popular baby names in 2014, and compared them with those of 2004, 1994, 1984, and so on, all the way back to 1884. Are unusual names more common in 2014? It was straightforward to analyze, even if it meant sifting through a lot of data. First, I looked at the 30 most popular names in each decade, and compared them to the total number of babies born. If there’s a trend toward giving babies more unusual names, then we would expect a smaller concentration of babies with the most common names. And wow, is that true, particularly for girls. Let’s examine female names first. But then something happened. By 1964, the figure had declined to 32 percent. It stayed roughly at that level until 1994, when it dropped further to 24 percent. And since then, it had declined dramatically to 18 percent in 2004 and 16 percent in 2014. The most common female names in 2014 are not very widespread. If the most common names are less widely used, the next question is what other names are being used? Are parents merely spreading their wings a little to other relatively well-recognized names, or are they pushing the boundaries of names? To test this, I broadened my analysis and looked at the 100 most common female names. In 1884, the most common 100 names covered 70 percent of girls born that year. Moving forward in time, we see a very similar pattern that we saw for the top 30. The figure declined slightly through 1954 (65%), and then those hippies from the 60s started becoming parents. The figure dropped 58% by 1964, 51% by 1974, and continues to decline. In 2014, the top 100 female names covered only 31 percent of births. So how much dispersion do we actually have here? Let’s look at the top 500 female names in each decade. Most of us probably couldn’t even come up with 500 different names, so surely they’re covering almost the entire female population, right? Well, that certainly used to be the case. In 1884, the top 500 names covered 90 percent of the female baby population, and sure enough, it follows the same pattern as my earlier analyses. The figure floated between 87 and 89 percent up until 1954, with remarkable consistency. After all, who can’t find a favorite name among the top 500? A lot of modern people, apparently. The figure dropped to 85 percent in 1964, 75 percent in 1974, and currently stands at 58 percent. Think about that for a moment. 42 percent of girls today have a name that does not fall into the top 500 most common names of her decade. How does such a phenomenon happen? One might speculate that this is due to a trend for adopting spelling variants. Evelyn, for example, has branched into both Evelyn and Evelynn. While I suspect that this is a significant factor, though, it appears to not be the main factor. Instead, what we see among our top 500 names for 2014 is that many names appear to be newly created, or at least exceedingly rare in past decades because they’ve never appeared on a top-500 list until now. Names like Brynlee and Cataleya and Myla and Phoenix have replaced more standard names. Another theory that I can’t confirm at this point is that perhaps the United States has more diverse immigration these days, which could be producing a greater diversity of baby names. Now let’s take a look at male names. The first thing we see is that male names have historically been compressed relative to female names. Looking across all of the decades since 1884, there are 1,286 male names that have placed in the top 500 in popularity, while there are 1,601 female names. So are male names still more concentrated among fewer options? We’ll repeat the analysis we just did for female names. If we look at the 30 most common male baby names, they constituted 56 percent of baby boy names in 1884. Per our earlier observation, this is much more concentrated than the 41 percent that we saw for females. Similar to female trends, though, the proportion was relatively stable for decades afterwards, still standing at 54 percent in 1954. The proportion began dropping in the 1960s, but was more stable than female names. By 1964, the figure had declined gracefully to 51 percent, then 46 and 45 percent in the 1970s and 1980s. The major decentralization for boys began in earnest in 1994, when the figure dropped to 35 percent, then 25 percent in 2004 and 20 percent in 2014, which isn’t notably higher than the female figure at this point. An interesting difference by gender occurs when we examine the top 100 male names. Whereas the distribution of female names was only minor through the 1950s, the distribution of male names actually decreased during that era. In other words, the 100 most common names became slightly more concentrated for boys from 1884 to 1954. Names became more dispersed through the 1920s, but the trend then reversed. The proportion of boys with top-100 names dropped from 74 percent to 69 percent between 1884 and 1924, then rose back to 76 percent by 1954. Perhaps during hard times of depression and war, parents get more conservative when naming boys. Or maybe mothers working on World War II assembly lines became enamored with mass production. However, from 1954 on, male names paralleled the diffusion of female names, dropping steadily to only 42 percent today. This is still more concentrated than the 31 percent figure for females, but is far lower today than at any time in the past 130 years. Finally, we look at the top 500 male names. Have males had the same dispersal as females? Contrary to other findings, male names were actually slightly more dispersed among the top 500 than female names in 1884. The 500 most popular male baby names constituted 89 percent of births, compared to 90 percent for females. But this discrepancy didn’t last long. While the top 500 female names dispersed slightly from 1884 through 1954, male names actually converged, reaching a high point of 94 percent in 1954. So while parents were practicing more creativity in female names over this period, they were becoming less daring with male names, choosing more often to follow popular trends. However, creativity took hold soon thereafter. Male convergence dropped slightly to 93 percent by 1964, then dropped steadily to a figure of 71 percent in 2014. So again, parents are increasingly choosing uncommon names for their babies in modern times, though to a much greater extend with boys than with girls. As with the girls, these boys’ names appear to be a combination of new spellings and also new names that have never before shown up in the top 500, names such as Daxton and Finnegan and Kasen. This is all well and interesting, but what does it mean? I’m first interested in the differences for women versus men? Why do parents feel greater freedom to give a female child an uncommon name? Do they feel a greater need to make a female child stand out from the crowd, and if so, why? Are males better situated to succeed with a more traditional name, or do more men simply get named after their fathers or other family members? Is the difference sexism in a very indirect form, or is there some logical reason? I’m at a loss to come up with a logical reason that doesn’t reflect different attitudes toward girl babies than boy babies, but I’d love to hear your theories. While the level of standardization differs between males and females, though, the patterns are moving in the same direction, and doing so strongly. Why are babies – both boys and girls – increasingly likely to be given uncommon names? One can surmise that it describes a society where individualism is being sought out more and more. It may also point toward a lesser desire or obligation to pass down family names and a lesser emphasis on tradition. So are we increasingly a nation of creative individualists or are we increasingly lost and rootless? Or both? I used a similar analysis to inform our decision about naming our baby girl in 2005, and then I wrote a conference paper about the experience in 2008. As we become a more diverse society, we have a larger universe of names to choose from. One, but maybe small, contributing factor to the disparate levels of diffusion may be one-way migration from boy to girl names. Boy names are feminized (Alexandra, Danielle), go from boy names to unisex (Jordan, Riley, Taylor), or almost completely move from boy to girl (Ashley, Carol) where the reverse of all these scenarios hardly happens.